The !Nara plant, also called !Nara fruit or !Nara melon, belongs to the family of pumpkin plants. The scientific name is Acanthosicyos horridus. It is a thorny shrub that is endemic in the Namib Desert of Namibia and only grows in the dunes along the Kuiseb river bed. This desert adapted plant has pile roots up to 40 meters long, reaching the groundwater with which it has no leaves, small flowers, but very nutritious fruits with seeds full of precious oils. Scientific tests have shown that the oil has more than 80% unsaturated fatty acids, 58% of which are polyunsaturated fatty acids, with an acidity of only 0.5, and the prickly, round fruits reach a size of about 15 cm at a weight of 1 kg. It contains up to 250 of these precious seeds. 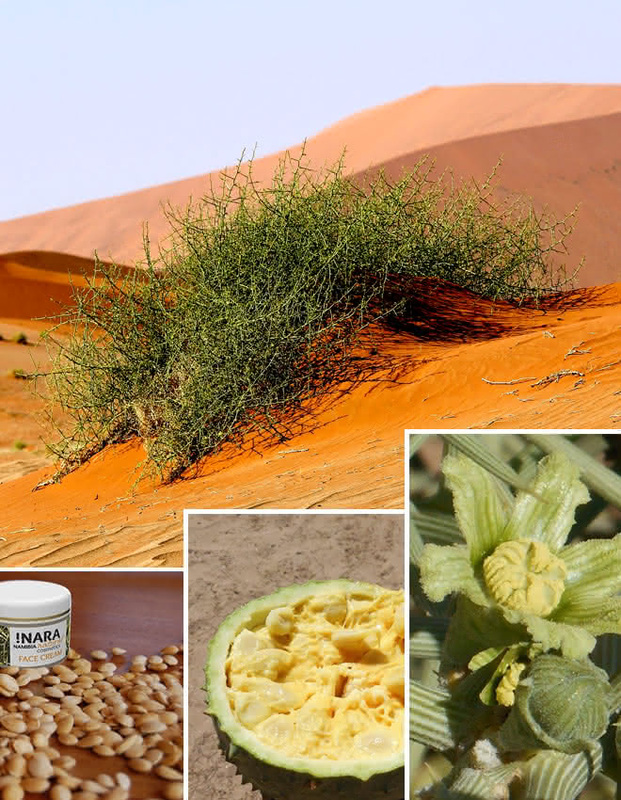 For the inhabitants of this region, the Topnaar, the !Nara is a very special, vital plant and an essential part of their diet, it is also called' bread of the desert'. The Topnaar have been used for centuries as food, medicine, thirst quencher and extract sunscreen products from their oil. The flesh is eaten both fresh and dried. This means that the Topnaar can also feed on the !Nara between harvest times. Even today, the Topnaar still move on their donkey cart into the !Nara fields to harvest the !Nara fruits by hand. Fairtrade is a high priority for us. At annual meetings with harvesters and the Topnaar dealer, harvesting conditions, prices and seed preparation techniques are negotiated. The healing and nurturing properties of !Nara oil have been known to the indigenous people of Namibia for centuries. For the !Nara cosmetic products, the dried !Nara seeds are cold pressed in a special, patented spiral press without the use of solvents or other additives. This pressing technique ensures that its valuable components are completely preserved. The 100% pure, cold-pressed !Nara oil has a very high content of omega-6 fatty acids and vitamins. These are very suitable for the treatment of dry, irritated and skin tending to skin diseases. Also ideal as an adjunctive care for neurodermatitis and psoriasis. The precious !Nara oil is present in all !Nara products to a very high proportion of up to 20%. Myrrh is a rubber resin of several types of balsamic tree plants that are found mainly in Somalia, Ethiopia, Southern Arabia and Namibia. The rubber resin is particularly aromatic and is therefore often used as a fragrance or body powder. 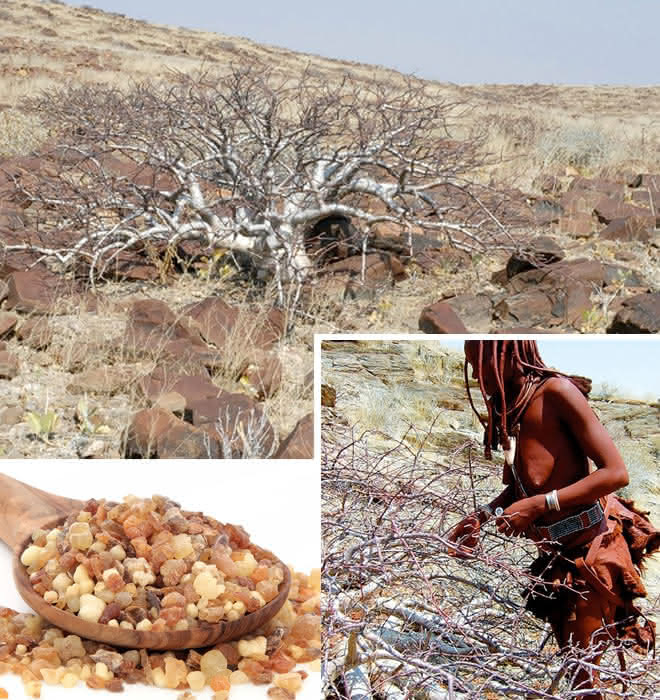 The myrrh used for our !Nara natural cosmetics is the special species Commiphora Wildii (Namibian Myrrh). This Namibian myrrh species ommiphora Wildii (Namibian Myrrh) is also known as Omumbiri. The women of the Himba nomadic people harvest the tree resin by hand in a traditional way. The scent of this tree resin is very spicy with a balsa undertone and also has slightly fruity components. The myrrh is fairly traded and comes from traditional wild collection. Myrrh is often added to perfumes and other cosmetic products as a fragrance. One can extract a very high quality essential oil from the resin Commiphora Wildii (Namibian Myrrh). Myrrh oil is traditionally used for cosmetic as well as naturopathic-medical purposes. It is used internally and externally. Intestinal cramps and inflammatory processes of the mucous membranes should respond to myrrh, since the essential oil can have a spasm-relieving, anti-inflammatory and scar-forming effect. All !Nara facial and body creams contain the high-quality essential oil of the myrrh, which is obtained by gentle steam distillation. In this respect, no distillation residues in the myrrh oil are produced as a result of this extraction. The essential oil of Commiphora Wildii (Namibian Myrrh) supplements the other high-quality ingredients of !Nara cosmetics with its spicy-balsamic scent. It's refreshing. Sensitive skin benefits from the anti-inflammatory properties of myrrh. Shea - or more precisely, the shea oil, which appears with its scientific name and in the cosmetic descriptions according to INCI as Butyrospermum Parkii (Shea) Fruit Oil in the product ingredients - is obtained from the fruits of the shea tree. The tree is located in Africa and is also known as the African Butter Tree, the Shea Nut Tree, the Butter Tree or Shea Tree. Shea has been an essential component of many cosmetic skin care products for a long time. The African butter tree is predominantly found in dry areas between Senegal and Uganda. Botanically, the fruits of the tree are berries. About 50% of these consist of valuable vegetable fat. Shea nuts are used to make the so-called shea butter. The seeds of collected berries are removed from the fruit flesh, dried and then crushed. After exposure to heat, the finished mixture is crushed. At the end, a yellowish or greenish yellow butter is created, which smells aromatic, spicy or nutty. The pure oil - Butyrospermum Parkii (Shea) Fruit Oil - can also be extracted from the shea nuts by cold pressing of the nuts. Shea butter is very rich in unsaturated fatty acids such as oleic acid and linolenic acid. It contains vitamin E, beta carotene and other valuable ingredients. Shea oil is not only used in cosmetics, but also as a substitute for cocoa butter, for example in the production of chocolate. 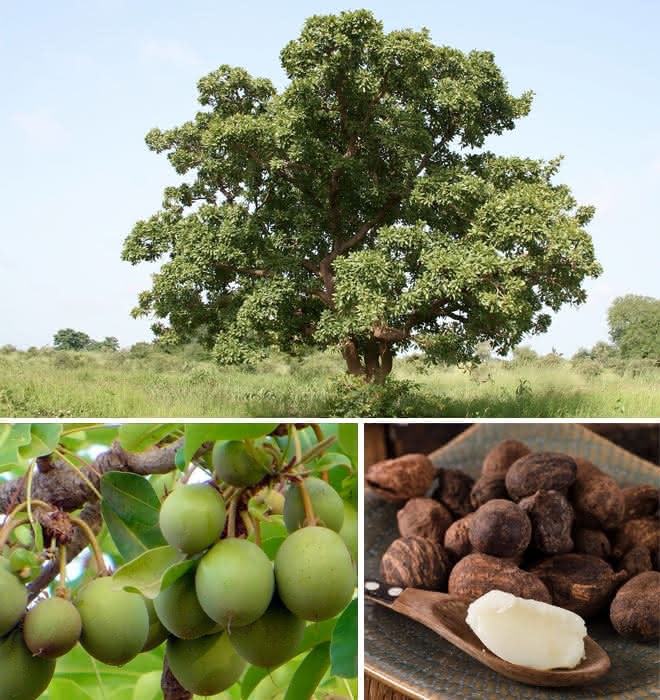 The oil used in all !Nara creams and deodorants comes from organic shea trees. Its content of unsaturated fatty acids nourishes and relaxes the skin, making it feel softer and smoother. The grease added with the oil is particularly kind to the skin and does not overstrain sensitive skin. When speaking of aloe, it predominantly means the so-called real aloe or aloe barbadensis, or aloe vera. Originally native to the Arabian Peninsula, aloe is now grown in all tropical and subtropical regions of the world. 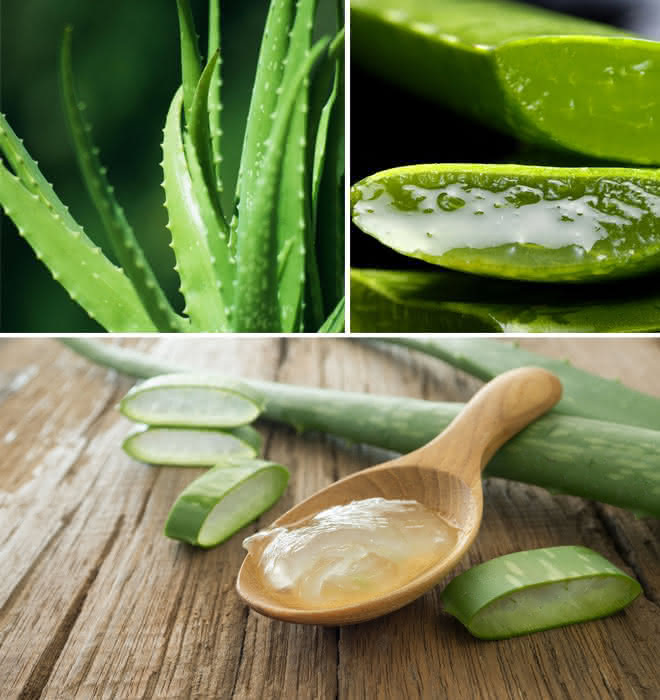 Among other things, it is the leaf extract - Aloe barbadensis (Aloe Vera) Leaf Extract - which is widely used in cosmetic and other applications. Aloe is now a focussed crop. Controlled and biologic fields are preferred by growers. you can gain a medicated extract from the the leaves (so called leaf extract) or a gel is expressed from the leaves. Leaf extracts should preferably be extracted by a gentle method, so that no residue remains in the extract, which can happen during chemical extraction. The fleshy tropical plant has been used in folk remedies and cosmetics for decades. Both the leaf extrac and gel are being used. Aloe can be applied externally or taken internally. Internally the steam extracted drug is used against constipation. Aloe Vera Gel vontains valuable polysaccharides, amino acids, some solubale vitamins and a variety of other components. Aloe is anti-inflammatory and moisturrising. The leaf extract used in our !Nara cosmetics comes from organic plants. In skin care, aloe has a positive effect on the skin's moisture balance, soothes and has a slightly anti-inflammatory effect. It is contained in almost all !Nara products and forms one of the most important care components in addition to the oily ingredients of the care products. Sensitive and hypersensitive skin types very often respond extremely positively to aloe. It is assumed that aloe also strengthens the skin's defence against harmful environmental influences and protects it from free radicals. Rooibos, with its Latin name Aspalathus linearis, belongs to the pulses and comes from South Africa. 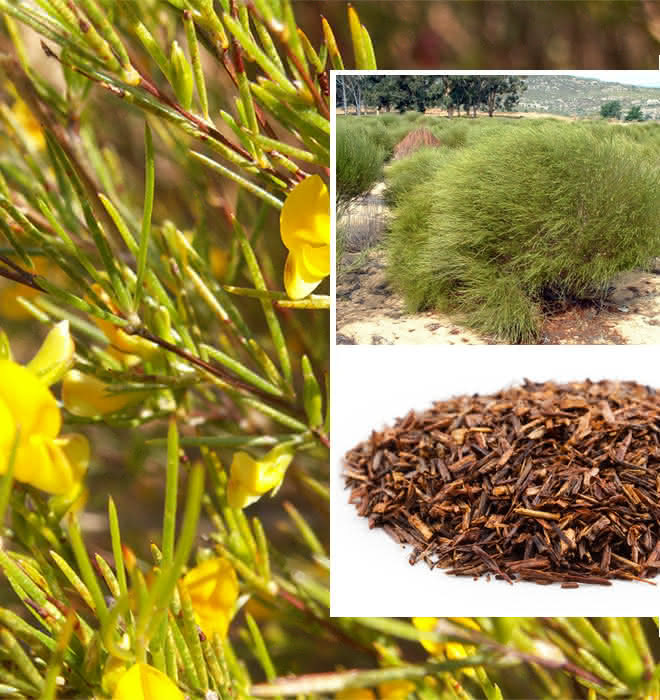 The best known is rooibos tea, but the extract from the leaves of the plant - Aspalathus Linearis (Rooibos) Leaf Extract - is also used in other products such as cosmetics. Rooibos comes from the South African province of West Cape. Controlled cultivation takes place exclusively in the area of the so-called Cedar Mountains, about 200 km north of Cape Town. During the growth phase of the shrubby plant, harvesting takes place from summer to early autumn, with harvesters traditionally, as in the past, using mainly manual tools such as a sickle and a few machines. We ensure that we harvest in an environmentally friendly way, so that only the young branches are cut. The older branches should remain on the plant so that it can grow larger every year. Leaf Extract - Aspalathus Linearis (Rooibos) Leaf Extract - is obtained from the harvested leaves by gentle distillation without leaving residues. Rooibos has many interesting ingredients. The plant contains various secondary plant substances such as phenols and flavonoids, as well as rutin. The leaves also contain various essential oils. Rooibos also impresses with its mineral content. Iron, copper and other minerals as well as trace elements are contained. Used internally as a tea, rooibos relieves cramping, soothes and alleviates allergy symptoms. Similar effects are described when used externally. Sensitive and reddening skin is soothed with Rooibos Extract. Rutin ensures that dilated vessels that promote redness contract. Also used externally in skin care, rooibos helps to reduce the risk of allergies. Copper is a valuable trace element in skin care. Jojoba Seed Oil (Simmondsia Chinensis), the oil from the seeds of the jojoba plant, is a very valuable vegetable oil that is almost indispensable for cosmetic applications. The jojoba bush is native to the deserts and semi-deserts of Mexico and California. Today, however, it is also grown in areas of Israel, Jordan, Egypt, Argentina, Peru and Australia. The plant creates a favourable microbiotope and protects soils from erosion. The capsules of the jojoba tree are harvested similar to olives and, like the olive fruits, are processed into an oil by cold pressing. Jojoba oil is rich in vitamin E and provitamin A. The composition of its fatty acids is particularly beneficial for the care of all skin types. As it is almost odourless, it can be used in a multitude of products. Another positive feature is that Jojoba hardly oxidizes and therefore stabilizes and blends very well. In addition to the cosmetics industry, the oil is also used in other industries as a lubricant or polish care product. For our products, only organic jojoba seeds are used in the extraction of the oil. The oil is extracted particularly gently by cold pressing. Sensitive skin is not irritated or over-cared by jojoba oil. On the contrary, jojoba balances the skin and has a slightly anti-inflammatory effect. Furthermore, this ingredient adds natural stability to the entire recipe and supplements the other valuable ingredients. 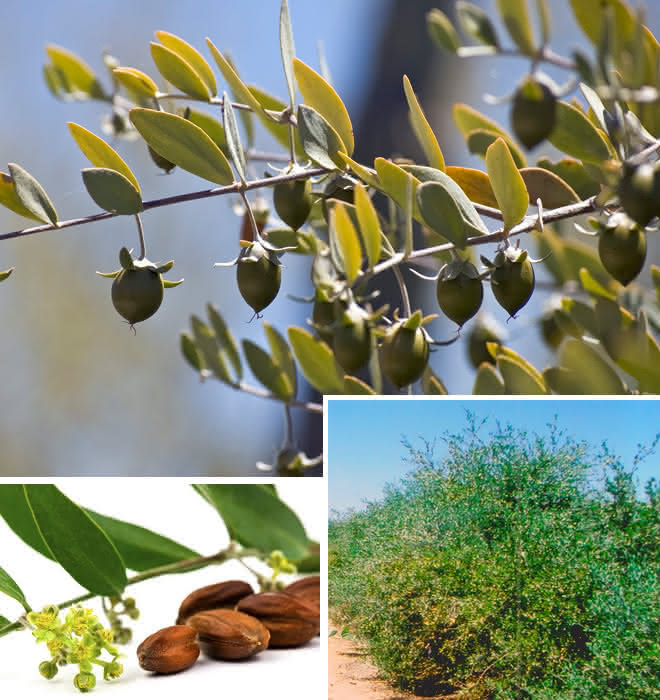 Jojoba oil is an essential ingredient in all !Nara products. Mafura - the butter obtained from the seeds of the mafura tree, the Trichilia Emetica (Mafura) Seed Butter - is a little-known ingredient in cosmetic applications. However, Mafura has been used in Africa for centuries, especially in hair and skin care. The mafura tree is mainly native to Eastern and South Africa, i.e. countries such as Tanzania, Mozambique, Zimbabwe or South Africa itself. The seeds, which are rich in oil, are the basis of many cosmetic and naturopathic applications. 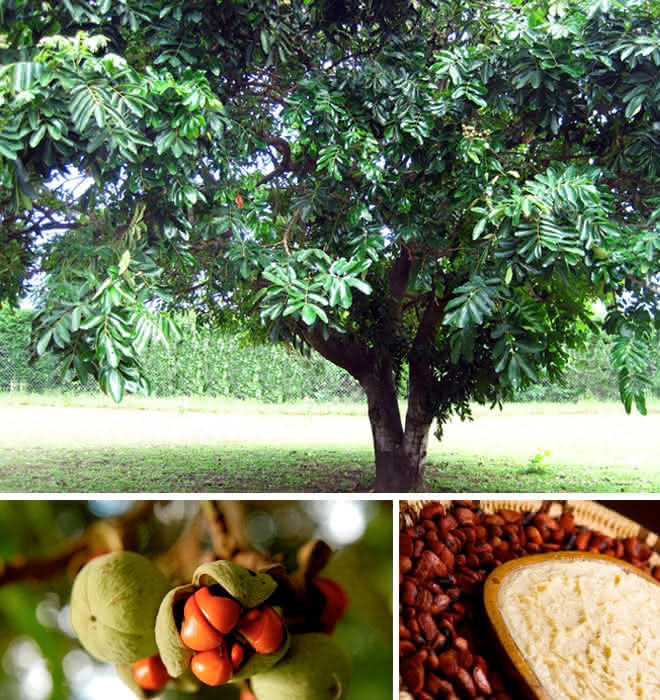 Similar to the berries of the shea tree, the mafura oil or the mafura butter is extracted from the seeds of the mafura tree. Traditionally, harvesting and processing is still done by hand. Mafura is rich in unsaturated fatty acids. When applied to the skin, it is absorbed very quickly. This makes it easy to spread on the skin. It is therefore often an ingredient of massage products. Dry skin benefits greatly from Mafura. The butter enriches hair conditioners and is used naturopathically for rheumatism. Mafura has a mild antibacterial effect, nourishes dry, sensitive skin and regenerates cells. It is an excellent addition to other oily ingredients such as jojoba oil. The plants are organically grown and the leaf extract is extracted gently without leaving residues. With Mafura oil, the skin feels very soft and supple.